When we’re talking with veterinary practice teams, the number one problem vets have with pet cages is this: the doors always get out of alignment and don’t slam/close the way they want them to. Even within just a few months of a new cage installation, the doors become misaligned making them harder to open and close. Why does this happen? And how can your practice avoid this problem? Let’s start with why this happens. Most veterinary cages and cage equipment are made with a thin 22 gauge stainless steel, which is not ideal for animal holding. The cage companies try to offset this weakness by putting a frame around the outside to keep the panels and doors from moving. Unfortunately, an outside frame alone doesn’t permanently stabilize thin stainless panels. When animals are moving about within a cage, thin stainless can’t help but move and shift. When comparing cages available on the market, a standard 24×30 cage tends to weigh less than 40 pounds, which is simply not heavy duty enough to stand up to the daily rigors of pets pacing and moving about while boarding or recovering from a treatment. It’s not uncommon for us to walk into a vet clinic with these lighter cages and hear that the doors became misaligned within 6 months of a new installation. We’ve also heard that many practices try to fix the doors themselves, or just give up and resort to lifting up the doors so they’ll open and close. That frustration really adds up when you have a room full of cages. The whole reason veterinary cage doors are designed with a slam-latch is for super easy open/close when you have an animal in your arms. But when the doors are misaligned, you can’t do that. You need two hands to deal with the door and it’s a real pain. How can you enjoy lasting stability in your large and small pet cages… for the lifetime of your practice? Do your research. It’s important to ask questions and compare answers among the various cage manufacturers because clever marketing can make anything sound heavy duty. First, choose a cage built with heavier gauge steel. For instance, 18-gauge stainless steel is much heavier, which means it doesn’t move and flex like 22 gauge. Plus it cuts down on noisy movement when an animal’s walking, so there’s less “thunder” noise that’s common with cages in dog kennels for instance. 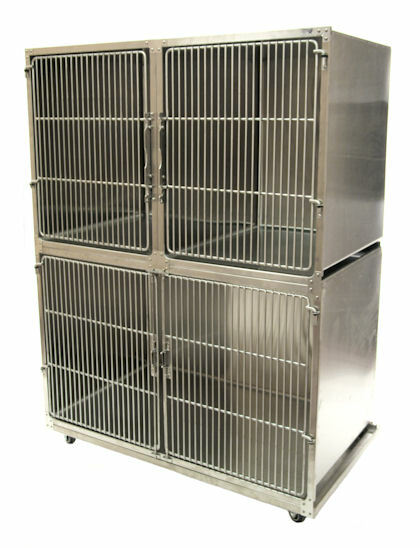 (Our Veterinary Titan Cages are made with 18-gauge stainless steel.) When you use a heavier gauge stainless, it eliminates the need for additional materials to quiet the sound. Next, ask the cage manufacturer about welded corners. When we manufacture our veterinary cage panels, we provide fully welded corners for lasting stability. This eliminates the need for an exterior frame for support, because the material itself supports the animal’s weight and gives the door a stronger structure. This image is a double door unit, with a stainless steel divider panel (div. panel not pictured). What’s nice is that there is no bottom track for the divider panel so you can remove the panel and convert 2 smaller cages into 1 larger unit. No bottom track is great for recovering pets so they can lie in comfort. Look for a heavier cage that can stand up to daily use. The average 22-gauge cage (24”W x 30”H) weighs less than 40 pounds as we mentioned. Our 24×30 Veterinary Titan Cage weighs 72 pounds. This means the cage panels and doors never move; or get out of alignment. So you never have to adjust them or struggle with the doors! What are the hinges made of? Some manufacturers use material other than metal or stainless for their hinges. We’ve found metal hinges produce long-lasting results. What is the thickness/diameter of the rod used for the doors? If the material is not thick enough, it can bend and twist if a persistent dog bites down on it. The TITAN door is 1/4” on 3/8”, welded at each intersection. As an added bonus we utilize medical lift-off hinges so the doors can be completely removed and replaced after a thorough cleaning. We designed the Veterinary Titan Cage to address one of the biggest pet peeves in the industry, and we’re finding that a growing number of doctors are excited about investing in a lasting, quality product that will be worth even more, years from now. What’s your biggest pet peeve when it comes to veterinary cages? We’d love to know, so we can fix it for you. Leave a comment below. Thank you.